Proposed improvements at Frisco Bay Marina hit a snag recently when the permitting process was delayed. Frisco council members and marina staff gathered Tuesday during a work session to discuss a plan of action for marina improvements while water levels are down, but ran into several factors delaying construction until spring 2013 at the earliest. The permitting process, which takes 90 days while working with the Army Corp of Engineers, environmental engineers and the Environmental Protection Agency, was originally started by marina staff at the beginning of the summer, but had to be started over three weeks ago as the scope of the project exceeds the original permit’s parameters. “The scope of the improvements that the marina needs exceed what is required by a national permit, so we had to start the process over,” said Phil Hofer, marina manager. 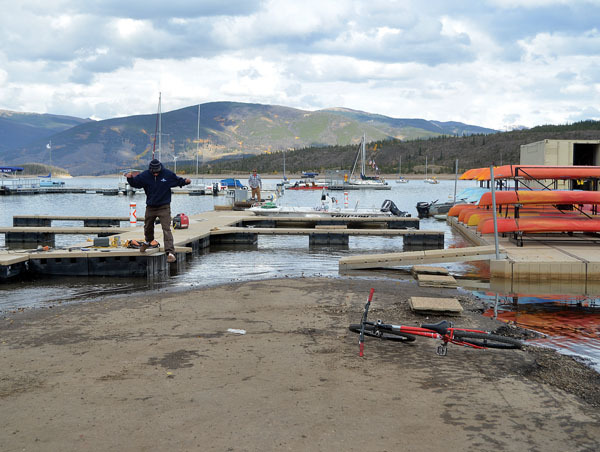 Low water levels in Dillon Reservoir adversely affected the marina, which lost $50,000 in revenue this summer, according to Diane McBride, director of recreation for the town. “The improvements would create enough depth in the Frisco marina to accommodate large vessels and keep water levels up during drought years,” McBride said. The construction would direct water closer to the marina and dock so that it would remain there during years where water levels recede from launching sites. During the work session, McBride and Hofer proposed upgrades including the dredging work, creating an additional channel from the removed material, expanding a roundabout and doubling the size of the ramp. The four projects, required to be completed during a time with low water levels, would cost approximately $600,000. McBride said funding for the improvements would come from a settlement with Denver Water, marina revenue and a portion would be borrowed from the water fund for the short term. Councilwoman Kathleen Kennedy expressed concern about the marina being at the mercy of weather conditions. “If we have this great winter after pushing this permitting process and construction to the spring and not being able to do it at that time, will we be stuck waiting?” she asked. Once marina staff obtain the permit for improvements, they have five years to begin the project. Currently, the reservoir is 18 feet below normal levels. Hofer told council Tuesday evening that the projection of the marina’s level with no snow what so ever, would be 40-50 feet below normal levels. “This is considering having no snow accumulation whatsoever, which isn’t likely but possible,” he said. Council said the issue will have to be revisited once the permit has been acquired.